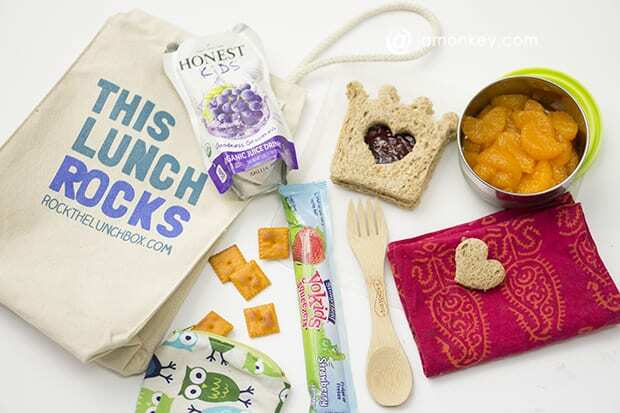 It's time to rock your kids lunchbox! Building it with the best in organic and healthy options. Here are some of our favorites along with all the essentials we use for great eco-friendly and reusable options. One of my daughters favorite lunches is a simple sandwich roll-up. Starting with whole grain bread, flatten it with a rolling pin. If your family is gluten free you can get Rudi’s Organic Bakery bread. Top it with some Applegate sliced deli meat. We are big fans of the Applegate Bologna! Then place a piece of sting cheese and roll it up. Cut it into bite sized pieces to look like sandwich sushi. To get a healthy balance of a full lunch we try to add in some fruit and veggies. I freeze Stonyfield YoKids squeezers so that they are perfectly thawed by lunch time. It also keeps the rest of the food nice and chilly. A nice little dessert of some Annie's Homegrown bunny fruit snacks. If we aren't drinking water or an Organic Valley single serve milk we pack Honest Kids juice. It's all packed up nice in our Laptop Lunches Bento-Ware. Some other great additions for lunches are the Applegate Half Time pre packaged meals that have crackers, cheese, and deli meat. Along with a Stonyfield YoKids squeezers and some Annie's Homegrown bunny fruit snacks. We like like a little GoGo-Squeeze also. With some fun cutters you can make lunch sandwiches less boring. 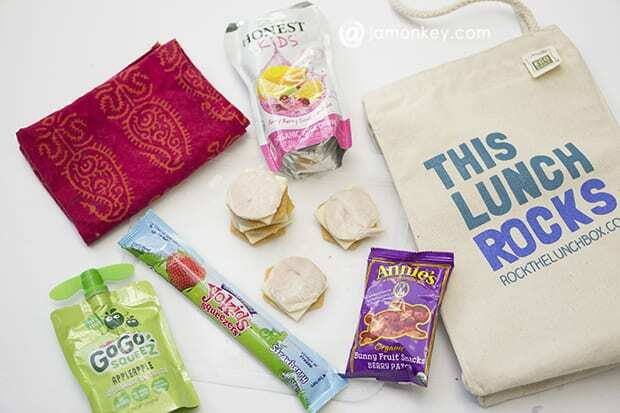 Make sure you're using reusable pouches and sacks. Plastic baggies fill up too much of our landfills. Make sure you get products that are BPA-free also. You can't go wrong with stainless steel containers and washable pouches with the Blue Avocado rezip reusable pouches. These are the products that make up my daughters dream lunchbox. They come home eaten every time. Here are more back to school lunch ideas. 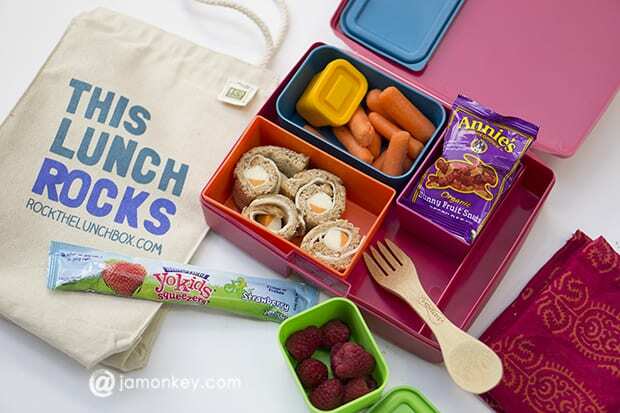 Make sure you check out Rock Your Lunchbox and Power Your Lunchbox for great healthy lunch ideas and to share your lunches with others. They may share them on their social channels. Here is a list of our go to products and everything you need for an eco-friendly and awesome lunch. Cute lunches! We have the easy lunchboxes and they really are just that! I love seeing that you pack a full lunch, too. I see some lunches and I’m like, where’s the rest? My girls eat all of this and come home starving! These all are great lunch suggestions. The sandwich roll-up Gif is brilliant, I had to call my kids over to see it. I really like the ECOlunchbox 3 in 1 in stainless steel, very chic. Cute lunch ideas! We have some sandwich cutters but that’s about where my creativity stops. I want to do more bento style lunches for my kiddo, and now I have some inspiration! We love Easy Lunchboxes for school lunch. This is the boy’s first time going to school 5 days a week, so I’m trying to plan ahead. My husband uses them more than the kiddos. She loves her Laptop Lunch kits. But they are perfect for him throwing them into a bag and not leaking.